27KmScarf will take place on July 29, 2018, at the Nelson Mandela Capture Site in Howick, KwaZulu-Natal. It will be a day filled with live entertainment and a brightly-coloured supernaturally long scarf. Anyone is welcome to come through on July 28 from 10h00 to help sew scarves together and on July 29, the site will be open the whole day with entertainment kicking off at 10h00. Since the earliest days of 67 Blankets for Nelson Mandela Day, Stuttaford Van Lines have supported the initiative. Once again, they have their engines revving in anticipation of the enormous pile of scarves that not only have to be delivered to KZN, but also collected and returned to all the provinces to be distributed. “In the year that the Nelson Mandela Foundation celebrates a great milestone in history, 67 Blankets for Mandela Day has brought the understanding of making history with work that will benefit those in need. The many people who have been involved in this project will bring much-needed smiles and warmth to so many in these very cold winter days” says Yase Godlo, manager of Mandela Day at the Nelson Mandela Foundation. Singing sensation Timothy Moloi will be lending his voice to the event, joined by local musicians including singer-songwriter, author and playwright Audrey Mbuyazi, flautist Kaolin Thomson Woods leading the Khazimula Orphanage marimba band, the St Johns DSG School orchestra and reggae band Undivided Roots. Once again, MCC have generously offered their services and will capture this incredible event from the skies using drones and a helicopter. Without the numerous volunteers and support from companies like Ballid Security Howick, Prosound and KZN Weddings and Functions, this event would not be possible. 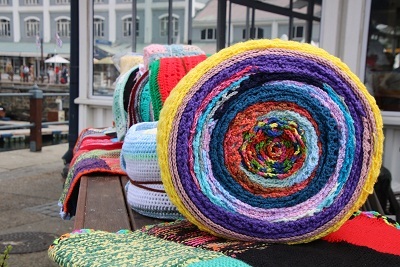 “We will show the world what we are doing, stitch by stitch, to keep the legacy of our beloved Nelson Mandela alive, by creating blankets and scarves for our fellow brothers, sisters, moms, dads and children who need extra warmth during our cold winter months,” says Carolyn Steyn, founder of 67 Blankets for Nelson Mandela Day. “This is going to be a celebration of note. We have achieved Guinness World Records in Pretoria, Cape Town, Johannesburg and now it is time for KZN to feel and experience the excitement and be part of our history as we mark and pay tribute to Madiba in his centenary year,” she adds. Following the 27KmScarf event, the scarves will be transported to all corners of South Africa and distributed to those in need. Although 67 Blankets for Nelson Mandela Day cannot guarantee the original scarves will be sent back to the provinces they came from, they do ensure that the same amount of scarves are sent back to be distributed. The Mandela Capture site is on the R103 (Howick / Tweedie off-ramp off the N3). Entrance is free and bring your own picnic, chairs and picnic blankets. There will be food for sale at the Truth Café. Visit the 67 Blankets for Nelson Mandela Day website http://www.67blankets.co.za and Facebook page https://www.facebook.com/67blankets to follow the build-up to this momentous event.